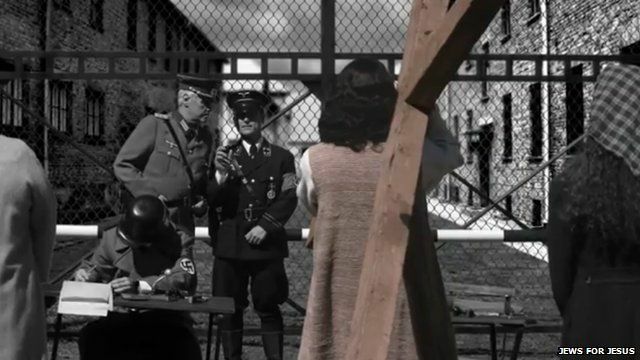 A promotional video for religious group Jews for Jesus has attracted controversy for depicting Jesus at a Nazi extermination camp. The video, entitled "That Jew Died For You," was posted earlier this month on YouTube and has already had more than 1.2 million hits. Rabbi Laura Janner-Klausner, from the Movement for Reform Judaism, told BBC Radio 5 live's Breakfast that the video was "abusing images of the holocaust to make a false claim" and should be removed. However Julia Pascoe, UK director for Jews for Jesus, said the video showed Jesus loved Jewish people and "put right the lie over history that Jesus was responsible for the Holocaust."